One of life’s great joys is getting your desk cleared off. From children and their homework to stay at home parents to the toughest office goers, a stack of papers that is crying out to be attended to us somewhere between annoying and paralyzing. Since the fire in June it has been my job to keep up with that the insurance company calls the dwelling reconstruction. The first step was easy enough. I had to remember as much as I could about the house itself. What fixtures and fittings, was it dry wall or was it wood on that wall? Were the walls 2 x 4 on the interior, to those are standard you know,were your standard? And on it goes. As I mentioned,those things were not hard. I even had a computer program to draw the floor plans for the insurance company. The person who came to estimate the cost of rebuilding the house was surprised and pleased with all I had rounded up for him to work with. I was able to sit with him and name almost every brand of every thing from carpet to cabinets to the shower and bath tub trim kits.The reason it was so easy was because I had either recently replaced it or I was plotting to replace it. The house was 15 years old and needed the usual repairs in a house that age. The faucets are starting to go, the paint needs to be redone, the carpet is looking like you wish it was in someone else house and the hardwood floors need to be refinished. With the hard work of the digging and planting and building raised beds and finishing some of the plumbing, I decided cabinets could wait until next year. Little did I know how right I was about cabinets waiting until next year! It is 2013 and I am going to meet with “the cabinet buy” soon. The budget for our new house specifies $13,500 in cabinets. I know I have been a DYI’er for a long time but I also hire professional help when I am in over my head (or as soon as I realize I am). I am not trying to say the cabinets are not worth the price I am saying that maybe my choices could be less than the anticipated price. I may be wrong but it is something I need to look carefully at before I run of and buy a $1,000 bathtub even if it is the ONLY model that we have found that will fit in my scrunchy bathroom. Either than one or no one. That is why my desk had to be cleaned up and seriously organized.We have to be able to make good decisions about where our money goes for each thing. I can find my desk, I can think about cabinets. I am very excited to be thinking past my infamous potties toward something so highfaluting as cabinets. It makes the house feel all the more real. More real than plumbing fixtures, more real than windows and doors, or floors, or curtains or appliances. Cabinets. They are attached to the structure and they hold our stuff. It seems to me that they are the penultimate representation of returning to our old, new life. Putting things in cabinets means that you can trust that the cabinets will not do hard to your things. You entrust your cabinets with your things. They will not burn them. So yet another hurdle is passed on the road toward really going home even to a new house. Now I will have to see how to make my tastes less than $13,500. We won’t have a kitchen just like this for and for window orientation issues but we are using this as our inspiration kitchen. 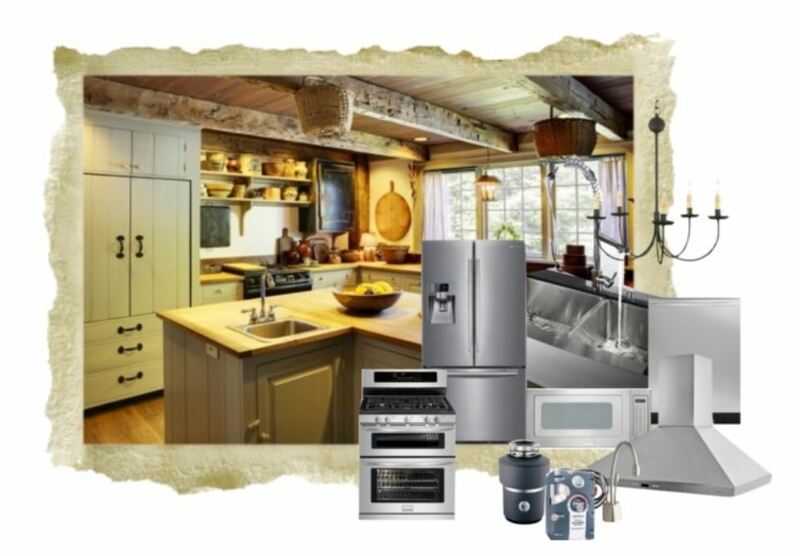 The appliances are mostly the same as we had in the old house and liked so that was easy!